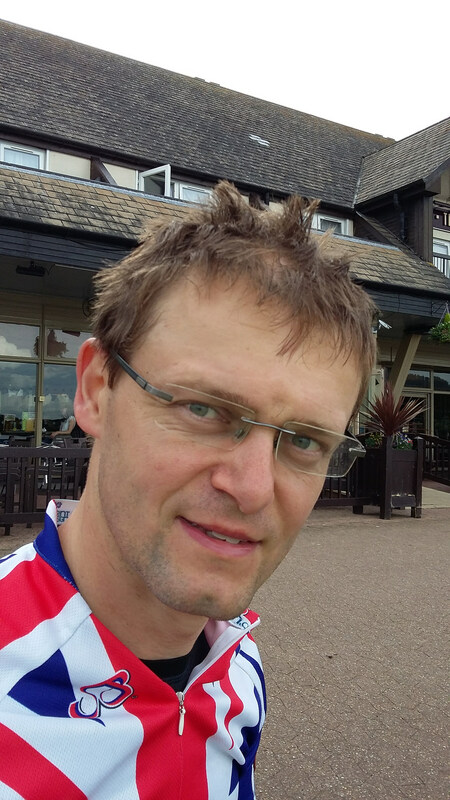 After many chats with Dave, we decided that we needed another crack at a 600k ride. Based on our experiences in Wales, we decided we’d try something different, so went for the flattest route available. Ely and Lincoln were the original objectives, with the Humber estuary also being a candidate, but in the end, we decided we liked the idea of the fens, so picked Skegness. Despite the flatness, the ride turned out to be somewhat of an ordeal. This was mainly due to the almost continuous heavy rain. In fact, it was raining heavily when I was leaving at 9am on Sunday. 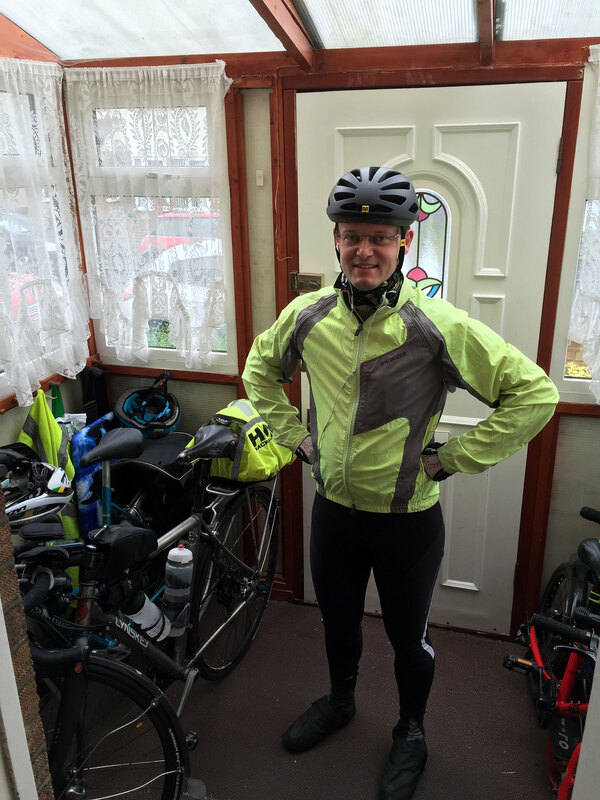 I had already decided to take full thermal gear, despite the promised 18 degree temperatures and the miserable start sealed it. The ride to Dave’s was fine, despite the rain. However, heading through Windsor park, my right leg began to hurt quite badly. Fortunately, this was cured by rapid use of Ibuprofen. This would twinge every now and again for the first few hours, but then didn’t bother me thereafter. Note sure what it was all about. 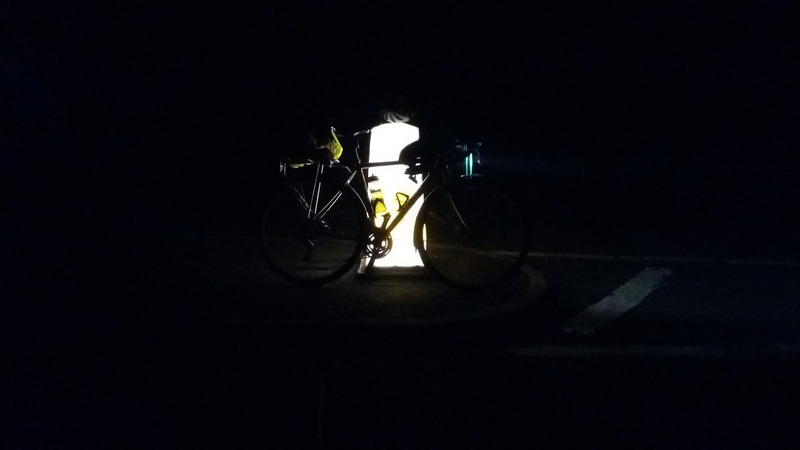 I then had two other potential disasters related to my Lumicycle headlight. First, pulling over after the road through Slough, I discovered that the mount had snapped and the light was bouncing against my spokes. I had hoped a new arrangement with the mount had solved this problem, which used to happen every 6 moths or so, but clearly, it had just been over 6 months since my last replacement! Fortunately, I had decided the night before t pack a spare mount. Somewhere on the horribly bumpy and busy road through Amersham, I decided it’d be a good idea to take the light off until I actually needed it, to reduce the chance of losing the final mount. When I stopped to do this, I discovered that the light wasn’t working and I couldn’t persuade it to re-start. Because of the bullet-proofness of the Lumicycle, I hadn’t bothered to pack a replacement. Never leaving home without the Hope 1 again! Frantic calls ahead to my brother in law secured a spare light. In the end however, a few hours in the trunk bag for light and battery seemed to cure all ills, and it worked faultlessly for the rest of the trip. I did however, take the offered spare, having lost faith! It could be that attaching a new mount in the rain got some contact wet, that then dried out in the bag. Somewhere after Dunstable, the sun came out and we were treated to quiet, smooth roads through the fens in the sunshine. This was definitely the high point of the ride. 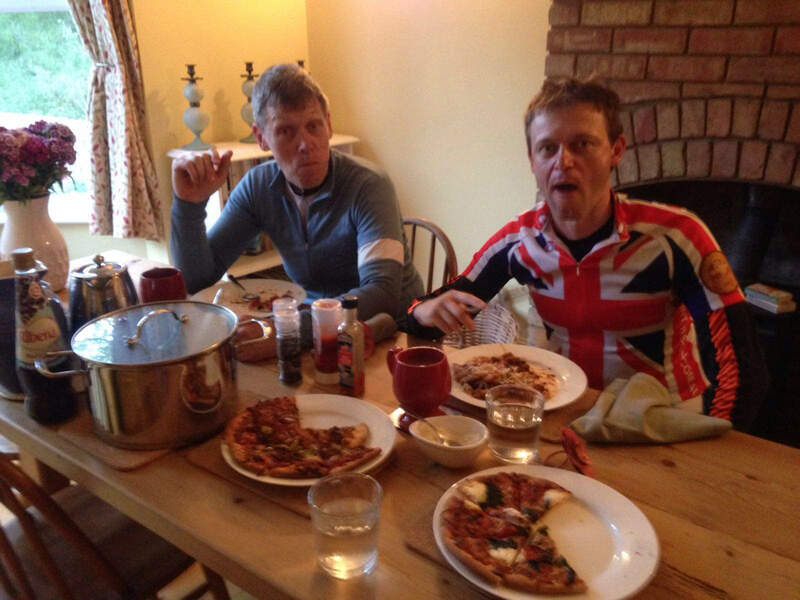 Then arriving at my brother and sister in law’s at Prickwillow, we were treated to a slap-up meal. Excellent. This got us in high enough spirits to play down the cracking of thunder as we left. I’d even swapped thermals for shorts! This of course, is when the truly torrential rain started. I tried taking photos, but none really did it justice. 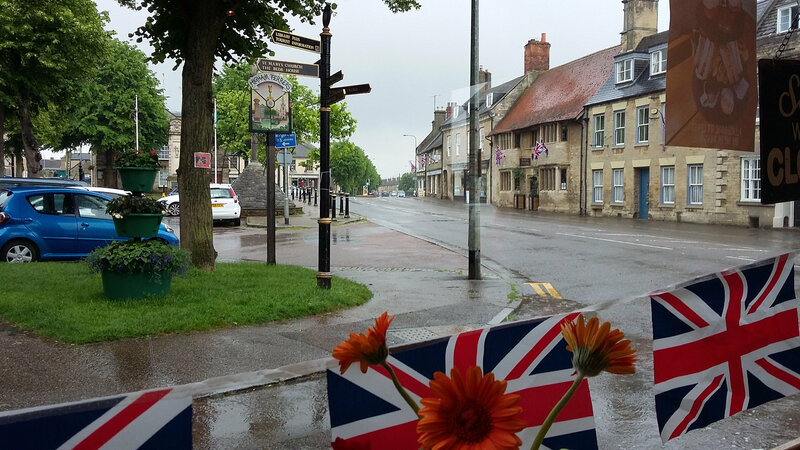 The rain continued to hammer down as we passed through Wisbech and towards Long Sutton where we dived into an almost impossibly welcome McDonalds. In fact, McDonalds turned out to be a great find on this trip. They are actually open 24 hours a day and you can see your bikes from your seat. Quick service too! The A17 and A16 to Boston went pretty quickly in a pace-line. While there were quite a few lorries, they were all very courteous and the road was nice and wide for overtaking. We got to Boston thinking that we’d pretty much make to to Skegness, but over 20 miles on the bumpy A52 ground us down somewhat. By this point, the rain had stopped, being replaced by heavy, wet fog. This meant that by the time we got to our “hotel” in Skegness, our clothes were still soaking. It’s a testament to the space blanket, that I actually managed to get 30-45 minutes sleep despite soggy clothes and temperatures close to 10 degrees. 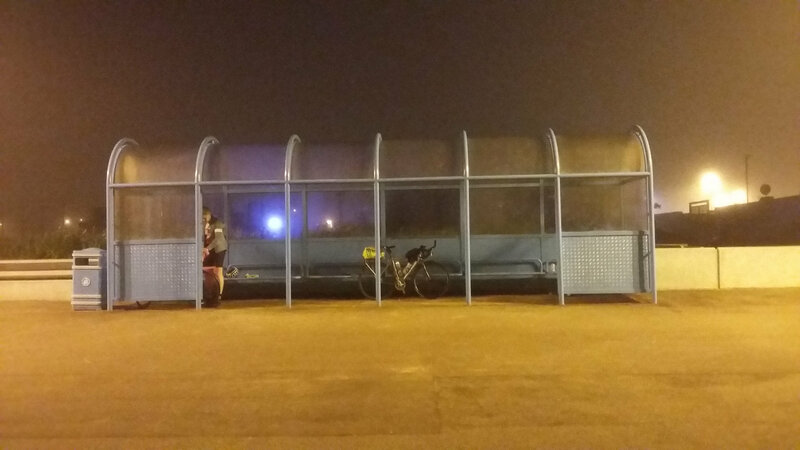 A 3am arrival was slightly later than I’d hoped, but surely we’d make up time without the rain. I woke up to a dawn over the sea at 4am and we pushed on while we had a hope of quiet roads. The small roads through the fens were nice and quiet, but rather rutted and bumpy. 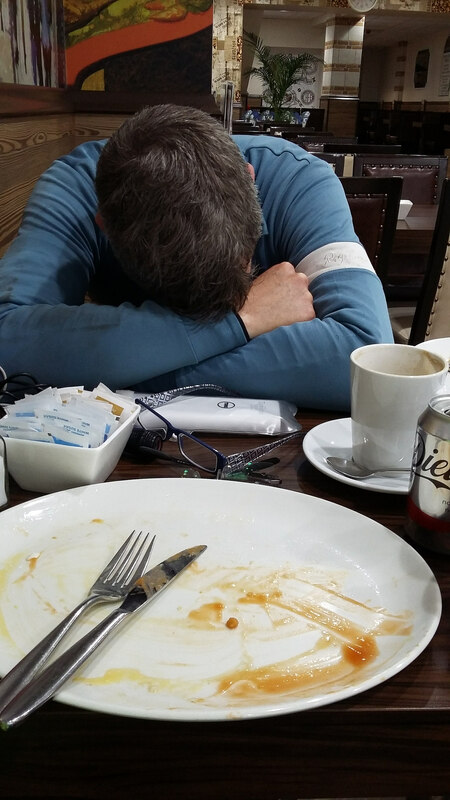 They continued to be poorly surfaced as we approached Sleaford, but the rush-hour traffic built continuously and it was with relief that we stopped for a slap-up breakfast. The roads after Sleaford seemed to be much quieter, so we relaxed a little. Then, at the bottom of a small descent Dave kept pedaling over a very small ford. I saw Dave slide sideways a couple of meters ahead and decided to pedal faster rather than attempt to stop as t was already too late. Both wheels went out from under me for a fraction of a second. 20m down the road after controlling massive wobbles, we were completely focused again. After this, the rain started to slowly increase again (cue another McDonalds shelter). It would reach a point where I was sick of it, then it’d get heavier. This went on for hours, culminating in cycling down a very busy, narrow and choppy A47 with a river pouring on us. In Higham Ferrers, a coffee shop (http://beanscoffeestop.co.uk/ I believe) owner rushed out and told us we could bring our bikes inside, round the back when they spotted us locking them up outside. The rain had turned torrential again at this point, so it was huge relief to do the faffing with bags and GPS under cover. Also, it allowed me to relax with the bikes secure. Waffle with ice cream, bagle and flapjack for the road were also all most appreciated. It was around this time that I noticed that Dave wasn’t eating much. As I was packing away waffles and burgers, he was having soup! He was feeling nauseous when eating or even drinking water. No doubt something evil picked up on his bottle spout from the endless spray on “country” roads. This lack of nutrition was starting to give him trouble and he struggled to stay on my wheel to Milton Keynes if I pushed at all. The ride through Milton Keynes was extremely pleasant on a network of small roads an good quality cycle paths. In the middle of this cycling joy was a beautiful lake where we took the opportunity for a quick rest. 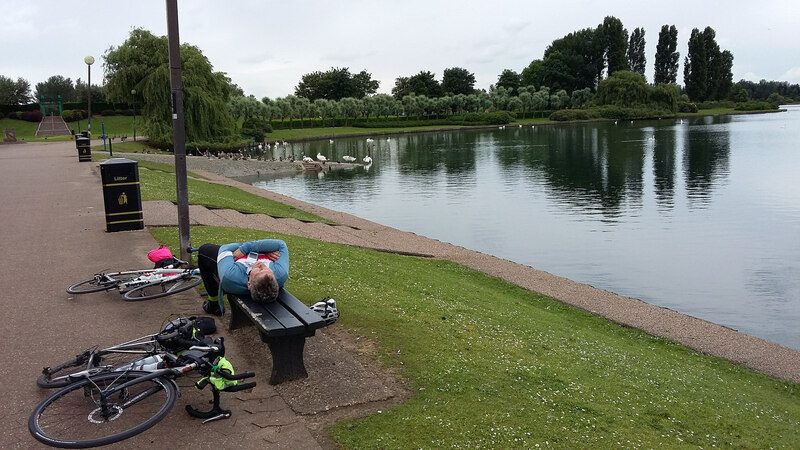 Despite his bench kip, Dave was still suffering on the ride from Milton Keynes to Aylesbury, only slightly ameliorated by ice lollies. Aylesbury turned out to be a truly horrible town for cycling with crummy surfaces, fast but narrow roads and a massive amount of traffic. Not to mention scary roundabouts and dual carriageways. It was exiting Aylesbury that Dave and I parted ways. 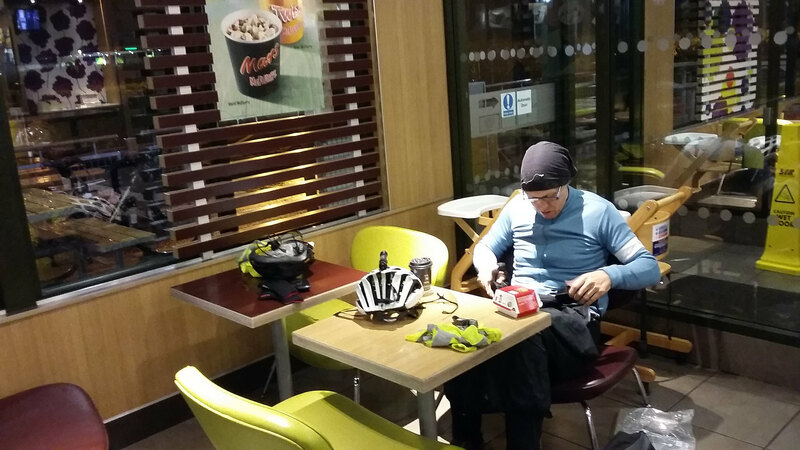 We were planning to do so further on, after the M4 crossing, but he was able to take a more direct and less hilly route back home, which made sense given his troubles. 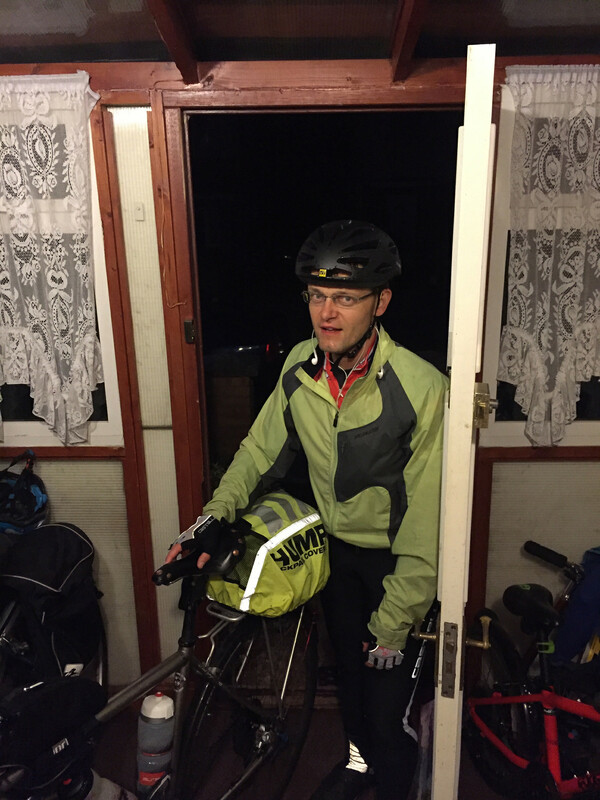 It turned out that Dave actually got home 30 minutes before me, so either his ice lollies jazzed him up, he had been playing me since Higham Ferrers and saving his energy sitting on my wheel, or most likely, I was actually also in a terrible state. As I got away from Aylesbury, the traffic calmed down and I ground out the final miles. I didn’t remember the exact route I had planned for the run in, expecting to be approaching Wokingham from the West, but actually coming at it from the East. It wasn’t helped by the fact that had confused the layout of Wokingham with Sandhurst or that there way yet another bout of torrential rain, hampering visibility and generally being miserable. However, at last, I was back onto roads I knew like the back of my hand through Farnborough and back into Aldershot. At last, I rolled up to my front door, where my wife had stayed up to get a picture of me creeping in at midnight of Monday / Tuesday. All in all, a great adventure, but really could have done without the rain and it being about 10 hours shorter.